Custom Gelato Six-Pack Classic Party Kit for sale. 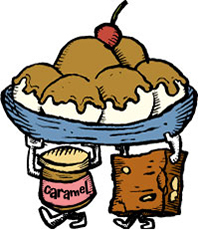 Buy online at Zingerman's Mail Order. Gourmet Gifts. Food Gifts. Gelato sundaes with nuts, caramel sauce, and a cherry on top. Eating gelato is an event, a special occasion that borders on a religious experience for ice cream connoisseurs. And eating a gelato sundae with nuts, cherries, caramel sauce—now that's an event to remember. Now you can pick your favorite flavors and assemble your own custom assortment of gelati for the ultimate sundae bar. You pick your six sixteen-ounce tubs of gelati, we'll pack them with Butter Toasted Peanuts, Fruit Perfect Sour Cherries, Coop's Salted Caramel Sauce, and plenty of cups, spoons, and napkins to make for a seriously flavorful party.